TLS (Transport Layer Security, whose predecessor is SSL) is the standard security technology for for ensuring secure, encrypted messaging across your API environment. You can configure TLS on API BaaS Portal and API BaaS Stack nodes. 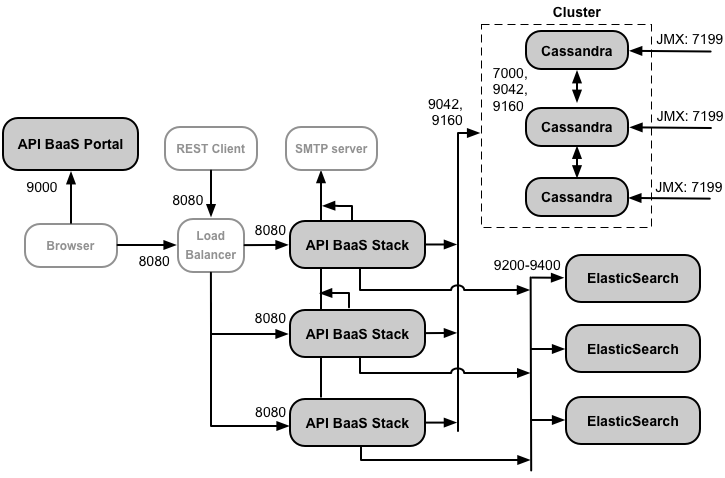 The following image shows a typical deployment diagram for API BaaS with a single BaaS Portal node and three API BaaS Stack nodes. Developers use a browser to make requests to the Portal. By default, the requests use the HTTP protocol on port 9000 of the Portal node. Note: The API BaaS Portal never makes requests directly to an BaaS Stack node. When a developer logs into the Portal, the Portal app is downloaded to the browser. The Portal app running in the browser then makes requests to the BaaS Stack nodes. This deployment includes a load balancer between the Portal and Stack nodes. In this configuration, the Portal makes HTTP requests to the load balancer, and the load balancer then forwards the requests to one of the the Stack nodes. This is the recommended deployment environment for a production system. In this configuration, developers use the HTTPS protocol to access the Portal, and the Portal running in the browser uses HTTPS to make requests to the Stack nodes through the load balancer. The load balancer uses HTTP to access the Stack nodes. For added security, configure the load balancer to use TLS to access the Stack nodes. In a small environment, such as in a testing or development environment, you might only have a single Stack node, meaning there is no need to include a load balancer. In this configuration, configure TLS on both the Portal and the Stack nodes. One option not shown above is to use a load balancer in front of the Portal node. In that configuration, you can configure TLS on the load balancer, and optionally on the connection between the load balancer and the Portal. Note: Because the Portal runs as a browser app, if you configure TLS access to the Portal, then requests from the Portal to the Stack nodes must also use TLS. Therefore, either the load balancer for the Stack nodes must be configured to support TLS or, if you omit the load balancer, then the Stack node must be configured to support TLS. The procedures below configures TLS on the default Portal port of 9000 and Stack node of 8080. However, you can change this port if desired. Note: This example uses port 8080 and 9443 for the TLS port, and not the more common port 443. The reason is that ports below 1024 are typically protected by the operating system and require the process that accesses them to have root access. The Portal and Stack run as the "apigee" user and therefore typically do not have access to ports below 1024. One alternative it to use a load balancer and terminate TLS on the load balancer on port 443. You can then use either HTTP or HTTPS between the load balancer and the Portal and Stack. In this example, you configure TLS access to use port 8080. However, port 8080 is not required - you can configure the Stack to use a different port. The only requirement is that your firewall allows traffic over the specified port. The Stack can only support one type of request (HTTP or HTTPS) over a single port. Therefore, if you configure HTTPS access on port 8080, you cannot use HTTP to access port 8080. If you configure the Stack to use port 8443 with HTTPS, then the Stack will no longer listen on port 8080. Note: Ensure that the password on the keystore and for key are the same. Copy the keystore JKS file to a directory on the Stack node, such as /opt/apigee/customer/application. The directory must be accessible to the 'apigee' user. # By default, TLS access uses port 8080. # Use this property to specify a different port. Warning: The password value has to be in clear text. Therefore you should protect usergrid.properties from unauthorized access. Use the tomcat-server_keyalias property to specify the keystore alias. You set the key alias at the time you created the key. For example, you can set it by using the -alias option to the keytool command. Use tomcat-server_ssl.protocols to set the TLS protocols supported by the Stack. For a list of protocols supported by Java 8, see http://docs.oracle.com/javase/8/docs/technotes/guides/security/StandardNames.html#jssename. If TLS is configured correctly, you should see a response containing status information. If you configured TLS access over a port other than 8080, modify the command above to use the correct port. Repeat on all Stack nodes. If you have a load balancer in front of the Stack nodes, configure the load balancer to make requests to the Stack nodes over HTTPS. See the documentation on your load balancer for more information. If the Portal makes direct requests to the Stack, configure the Portal to access the Stack over HTTPS as described in the following section. Use the procedure below in "Configure API BaaS Stack nodes for TLS on the Stack or Portal" to ensure that the Stack node has the correct TLS URLs when generating user responses. The BaaS Portal running in a browser functions by making API calls to the BaaS Stack. If you configure the BaaS Stack to use TLS, then you must also configure the Portal to make those calls over HTTPS. Configure the load balancer to make requests to the Stack nodes over HTTPS. See the documentation on your load balancer for more information. In this configuration, the Portal can access the load balancer over HTTP or HTTPS, depending on how you configure the load balancer. If the load balancer uses TLS, use the procedure below to configure the Portal to make requests to the load balancer of HTTPS. Configure the Portal to access the Stack over HTTPS as described below. Configure TLS access on the BaaS Stack as described above, or on the load balancer for the Stack nodes as described in the documentation for your load balancer. Specify as the value of this property the IP address or DNS name and port of the API Stack node for a single node installation, or of the load balancer if you have a load balancer in front of the API BaaS Stack nodes. Specify the IP address or DNS name and port of the API Stack node or load balancer. By default, users access the Portal by making unencrypted HTTP requests over port 9000 on the Portal server. You can configure the portal to use HTTPS to encrypt the data send to and from the portal. Note: Because the Portal runs as a browser app, if you configure TLS access to the Portal, then requests from the Portal to the Stack nodes must also use TLS. Therefore, either the load balancer for the Stack nodes must be configured to support TLS or, if you omit the load balancer, then the Sack node must be configured to support TLS. In this example, you configure TLS access to use port 9443. However, port 9443 is not required - you can configure the Portal to use a different port. The Portal can only support one type of request (HTTP or HTTPS) over a single port. Therefore, if you configure HTTPS access on port 9000, you cannot use HTTP to access port 9000. If you configure the Portal to use port 9443 with HTTPS, then the Portal will no longer listen on port 9000. Create a key file and cert file in PEM format. Note: Ensure that there is no password/passphrase on the key or cert. Copy the PEM files to a directory on the Portal node, such as /opt/apigee/customer/application. The directory must be accessible to the 'apigee' user. # By default, TLS access uses port 9000. Use baas.portal.ssl.protocols to set the TLS protocols supported by the Portal. For a list of supported protocols, see the list of SSL protocol names defined by Nginx: http://nginx.org/en/docs/http/ngx_http_ssl_module.html#ssl_protocols. Use the procedure below in "Configure API BaaS Stack nodes for TLS on the Stack or Portal" to ensure that the Stack node has the correct TLS URL for the Portal. If you modified portal.properties, configure the Portal node:? ?